What will it cost? is the biggest, most pressing question we get when discussing website development with prospective clients. It's a fair question, but not always the easiest to answer quickly, especially if you don't know the full scope of your own requirements. This is why we always offer a free meeting, during which we can learn more about each other, gather your requirements and move towards a creating a meaningful set of recommendations and a costed plan. 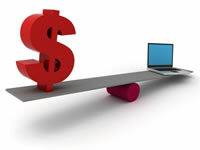 What factors affect website costs? Website design and development has changed a lot over the last decade and the options that we have to consider with clients has grown hugely. While the majority of our clients are still those who want a strong degree of design customization and finesse, and who need our services for custom websites and databases, a growing number of clients have needs that are a good fit for off-the-rack packages like WordPress. We enjoy working on the full range of website developments, from the quick set-up and tailoring of a WordPress template site for a small business owner wanting total control over content updating, to the complex and dynamic website developments of clients with more demanding requirements and multiple streams for content display and updating. All of our clients have at least this in common: they understand the value of engaging professionals to work on their web project and desire a polished and functional end product. Typically, they are also prepared to trust us with their plans and aspirations and to consider new ideas or questions as we raise them to explore together. They also value the 360-degree perspective that we bring to web design and feel good knowing that we can make well informed recommendations on every aspect of their project.